To put it mildly, we’re excited about the Coleman Power Chill 12 Volt Thermoelectric Cooler. To be more accurate, we can’t contain ourselves! We’re fidgeting and shaking and just raring to go! This isn’t the first time we’re talking about Coleman coolers (check here, here or here). This is a great line of coolers that anyone would be proud to own. In fact, to reiterate what we’ve said before, there’s a high likelihood that you’ve owned a Coleman cooler before. If you haven’t then someone you know has. This is a very old and very popular brand. They have managed to stay relevant for so long in a constantly evolving market because they stick to what works and discard what doesn’t. So what makes this electric cooler such a beauty? Well, we want to find out. Would you like to join us? Where do we start? There is a hell of a lot to say about this cooler! To begin with, it’s not quite a cooler, and it’s also not quite a refrigerator, either. 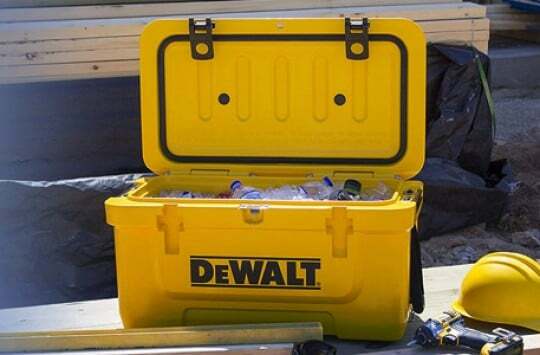 Let’s face it, you don’t always have the time to pack your cooler with ice in readiness for the trip. You also don’t always go to environments where the ice is easy to replenish. It might also not be likely to last as long as your trip, especially if you’re going to be out for a long while. 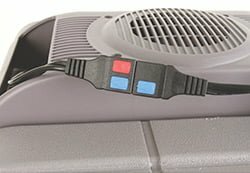 Wouldn’t it be cool if you could just plug your cooler to your car or boat power source and use the good old power of electricity to keep things warm? We think it would, and so do Coleman. So they came up with this excellent little cross between a cooler and a refrigerator. Let’s start with the door. We couldn’t get enough of this door. It opens from both sides! It’s been made so that it can open both from the right and from the left. I swear I was there for a full 5 minutes just opening and closing the door from both sides to get a feel for it. It is absolutely fantastic! To make it even better, that’s only the beginning of the good stuff! It also comes with two different orientations. 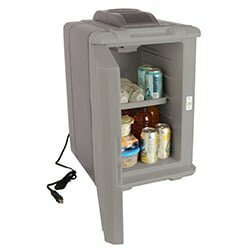 Because of the specific design of the door, as well as the cooler itself, you can use it either as a traditional ice chest or as an upright cooler. Hey, whatever works for you, right? I swear I don’t remember the last time I saw something this versatile in the coolers market! It is also extremely lightweight for an electric cooler, weighing only 18 pounds. That’s an excellent weight for travel, making it pretty easy to haul it in your car as you travel around. This refrigerator is designed to keep things either 40 degrees Fahrenheit above or 40 degrees Fahrenheit below the ambient temperature. That’s why we said it’s not quite a refrigerator. You can use it to keep your drinks cold and your food warm as well. So if you go to a place with an ambient temperature of 70 degrees Fahrenheit, it will keep its contents at either 30 degrees Fahrenheit on the lower side or 110 degrees Fahrenheit on the higher side. One catch you need to be mindful of with this thermoelectric cooler is that it takes about 3 hours to achieve the maximum difference in temperature. You should therefore either have the contents pre-chilled or pre-warmed before you use it. Once it hits the maximum, though, it’s going to keep it up for as long as it’s plugged in. 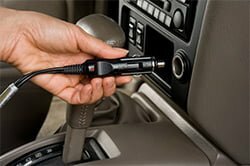 The power source only needs to be 12 volts, which makes this cooler an excellent choice for those who want something that’s compatible with the outlet on their car or boat (know as cigarette lighter receptacle). It will take 60 watts or 5 amperes, which is easy to get from your car and has a power cord that’s 8 feet long. That’s more than enough length to have to cooler plugged in and set up wherever you want it to be set up, pretty much. 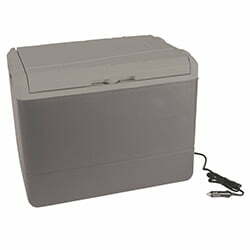 This is an excellent thermoelectric cooler for those long trips you take by boat, in your truck, family car, or RV (we’ve reviewed more electric coolers here). You don’t have to worry about your ice not lasting long enough because when it runs out you can simply plug the cooler in and enjoy a warm or hot supper and a drink using the power of your car battery. It also has a 40-quart capacity, which will hold 44 cans. That’s more than enough for an average long car trip. You’re certainly not going to be running out of juice very soon! On the inside of the cooler, you’ll find a neat storage tray that helps you keep the contents of your cooler well organized. Lightweight design – 18 lbs. Ext. dimensions: 23.5 x 15.3 x 17 in. The Dometic CF series has one major advantage over the Coleman PowerChill, and that is the variety when it comes to sizes. You can find a Dometic CF cooler for just about every volume need you have, which makes it pretty convenient. It also has a lot more options in terms of input options, being able to take power from your car battery, another battery, the mains; pretty much any power source! The one major disadvantage is that this cooler cannot warm your food, unlike the Coleman. You also don’t get a cooler that can be used upright and you don’t get a door that opens from left as well as right. 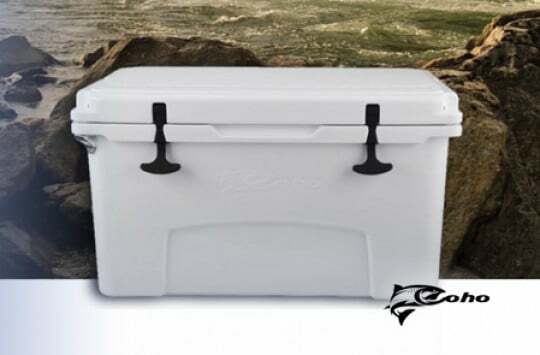 We feel that has to be mentioned with a cooler as magical as the Coleman! 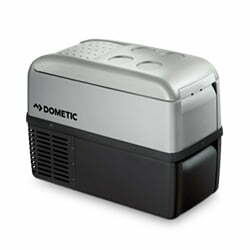 Check our Dometic Cooler Review post or get it on Amazon here. 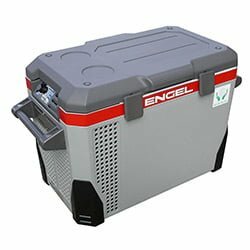 Okay, the major disadvantage with Engel 12V Fridge/Freezer competitor is that it can’t warm your food like the PowerChill. It does have AC/DC capabilities, however, making it able to draw power from any power source. It also has variable temperature control, which the Coleman doesn’t, and automatic voltage selection. It’s an ice chest, though, and the door doesn’t open from the left and right! 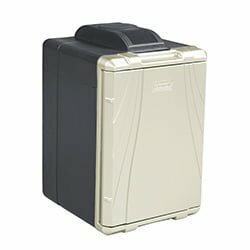 You can buy the Coleman PowerChill from lots of places online but the best place to make your purchase by far is Amazon. On Amazon, you get to read real reviews by other customers before you make your decision so it is an informed one. You can also return a product if you don’t like it within 30 days. With the Coleman, you get a limited 1-year warranty and the support on Amazon is pretty great with any warranty issues. You also get free delivery on select products if you’re a Prime member. All in all, there are lots of benefits to go round. We are super excited about this Coleman classic and we think it will go down in history as one of those things that end up wildly popular, just like many of Coleman’s other products.